Located 2 min walking distance from the central train station and 15 minutes’ walk from the beach, this property offers a fully renovated art design building vibrating around the theme of Music. Fast free Wi-Fi available throughout the property, check out until 11 am, breakfast served in the morning, outdoor patio available, social areas to meet new friends. Luggage room available, 24-h CCTV for your security. Our multilingual staff will be very happy to help and assist you during your stay with us. 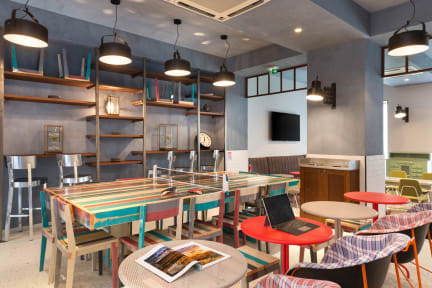 Ozz Nice is well-located in Nice, near the train station and a short walking distance to Nice Etoile Shopping Center and Marc Chagall National Museum. 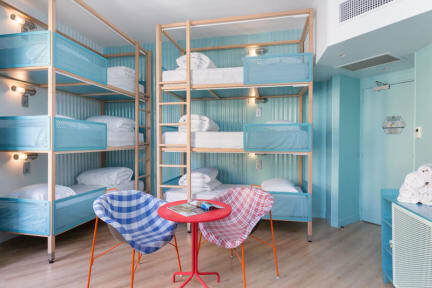 The hostel is only located 15 minute walk from the main beach and the famous “Promenade des Anglais”. Ozz is a stylish hostel. All bedrooms are fitted with toilets and showers, private lockers, unlimited free WIFI access. A reading light and electric plug are fitted on each bed. Bed are fitted with linen, duvet and pillow. This property may pre-authorise your card at anytime before arrival. Is a pre-authorisation is not possible your booking might be cancelled. Taxes not included - Local occupancy tax 0.65 euros per person per night. Please note: during the peak of the tourist season local tax will be: 0.75 euros. Breakfast not included. Extra-cost: 5 euros. Great place to stay! Super clean, free coffee, and a short walk to everything we needed! This was one of the best hostels I stayed at in Europe. It is located a few blocks away from the train station. But also close enough to walk to the tourist sites. It is well priced and very modern. Apparently it was converted from a hotel a few years ago. Entire building, including the individual room bathrooms were very clean. They offer a complimentary hot drink machine that other hostels charge two euros a cup for. Good for solo travelers with lively common area. Nice staff, clean room, excellent atmosphere and facilities. Location at proximity to train station, airport bus shuttle, tram stop and main shopping street. The area itself looks tiny bit fo shady, but didn't have any issue getting there late nights. Will recommended, no doubt. Great place, centrally located. Would recommend to anyone! Good location and vale for money. The place was really close to the train station, but it’s a 15 minute walk to the beach and old town. The bathroom smelled awful while I was there. There is no soap in the bathrooms either. Other than that, the stay was fine. This is a perfect place as far as location is concerned; close to Gare de Nice ville rail station. The guys manning the reception were helpful. But the raucous cries of some boarders around 9pm next to the dining space was unbearable. There should have been a division between these two rooms. They may howl, but they have no right to make sombody' lives hell. Please see to it. I enjoyed sitting in the terrace. For breakfast, I'd suggest to buy food from nearby groceries. Sea is just 15 min away.